SAN ANTONIO—Calling the disturbing incidents a persistent source of anguish, GOP presidential candidate Ben Carson told reporters at a Monday campaign stop that he has been tormented by periodic rational thoughts for the past several years. “They certainly aren’t around all the time, but every now and then I’m afflicted by these very distressing impulses to do or say something logical about immigration or gun control,” said Carson, describing the severe mental discomfort that he has suffered from intrusive coherent thoughts on climate change, abortion, and homosexuality. “When they do appear, it’s like a dagger in my mind urging me to act reasonably. If I really concentrate and calm myself down, I can make them go away. But I can only ignore them for so long. 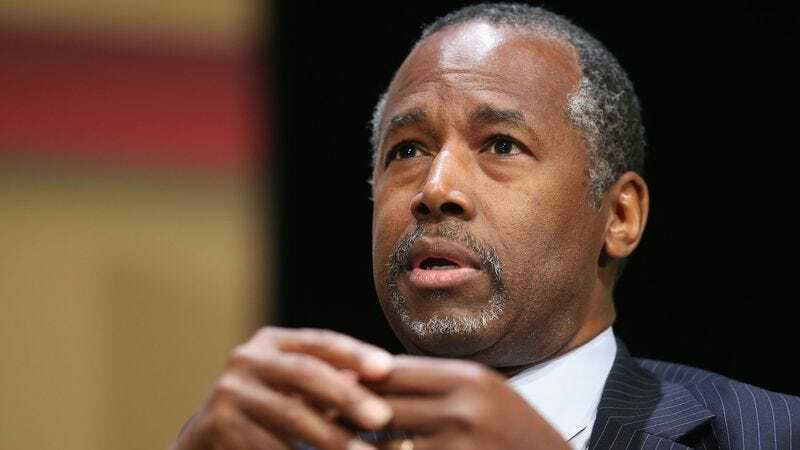 One day, I might slip up and behave sensibly if I don’t remain vigilant.” At press time, a visibly upset Carson had reportedly closed his eyes and quietly repeated, “Just go away” in an effort to silence the voices in his head urging him to apologize for equating the Affordable Care Act to slavery.